Here are several "weave" drills. The old weave drill is excellent for passing and catching on the sprint, as well as conditioning. This old drill is still one of the best for passing and catching on the move and conditioning. Players start at one end of the court in three lines, one in the middle and one near each sideline. The middle player O1 starts the weave by passing to one of the sideline players. O1 then cuts wide around and behind player (O2). O2 now passes to the opposite sideline player (O3) and cuts around and behind O3. O3 now passes to the original middle person (O1) and cuts around O1. And so it goes (see diagram). No dribbling is allowed except for one dribble to finish the lay-up. The ball should never touch the floor except that the last pass to the shooter is always a bounce-pass. We will first run the drill with chest passes, and then again with bounce passes. Receivers should move toward the ball, and show a target for the passer. Players should stay wide and always cut around and behind the player they just passed to. Passers must call out the receiver's name before passing and the number of the pass in the sequence (e.g. "Ross 1", "John 2", "Bill 3"), and receivers should yell "ball". With our high school teams, we will initially run the drill with five passes being made before completing the lay-up. Finally, we will run the drill with each team using only three passes to complete the drill... now they really have to sprint. We expect players to run the drill at full-speed at all times. If not, stop the drill and have them just run some full-court sprints. Most players would rather run the drill than sprints. The next three-some can start once the previous group is beyond half-court. Start a new line at the far end, and when all groups have come to that end-line, go back the other way. If we have an odd number, the one or two players left behind will yell "one (or two) back!" and a player(s) will sprint back and go again with that three-some. Here's another option you can use when running the 3-man weave above. You can also get two 3-point shots in transition each trip. Have managers (or assistants, or players waiting in line) on each end of the court. Players run the 3-person weave full-court just as above. The only difference is that the trailer (last person down the court on the weave) and the passer fan out to the wing, 3-point arc area on opposite sides. Both players receive a pass from the assistants (or players on the endline) and shoot the 3-pointer. They get their own rebound and give the ball back to the assistants (or players on the endline). You can make a team competition out of it by keeping track of the total team score (maximum score of 5 each trip - count 1 for the lay-up and 2 for each of the "3's"). Run the drill for 2 minutes and see what their total team score is... you can set a number that they have to achieve, or else it's push-ups or running for everyone if they don't make the goal. Here is a variation of the three man weave. In the 5-man weave drill, five players are used and run the traditional weave up the floor, followed by at 3-on-2 break, and finally a 2-on-1 break. In the 5-man weave, the passer cuts outside around two players. It becomes a transition drill on the way back. Coming back up the floor, it is a full-court 3-on-2 situation. The two defenders are: (1) the player who shot the lay-up, and (2) the person who made the assist pass for the lay-up. These two players sprint back on defense while the other three attempt to push the ball up the floor and score. Finally, it's 2-on-1 full-court back up the court. The last player to have the ball in the 3-on-2 above (usually the shooter, or someone who turns the ball over), sprints back as the defender, while the two defenders from the 3-on-2 break are now on offense. Click here to see how we defend the 3-on-2 and the 2-on-1 break in transition. Click here to see how we attack offensively in the 3-on-2 and the 2-on-1 breaks in transition. This is a good half-court weave drill that combines the weave with mid-range jump shots, defensive close-outs, boxing-out and rebounding. This drill could also be used as a pre-game warm-up drill. See the diagrams below. Diagram A... players line up at the half-court line in three lines (1, 2, and 3). Two players (4 and 5) start on the endline, just outside the lane lines. 2 starts the weave, passing to 3, and then cuts back behind 3 (wide), and to the hoop. 3 passes to 1 and cuts wide behind 1 to the left side. 1 passes (bounce-pass) to 2, and 2 completes the lay-up, and retrieves the ball. 1 cuts to the right elbow or free-throw line-extended area, while 3 cuts to the left side. 1 and 3 give a hand target, and 4 and 5 pass to 3 and 1 respectively (diagram B). 1 and 3 shoot the mid-range jump-shots. 4 and 5 close-out on the ball (yelling "ball, ball, ball" and "shot"), and then box-out and rebound. 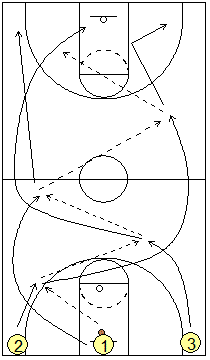 Diagram C... players rotate so that the shooters 1 and 3 become the passers on the endline, while 2, 4, and 5 go back to the half-court lines. This drill features a number of fundamentals and some running, and is therefore a good pre-game drill.